The Sangeet Natak journal of the Sangeet Natak Akademi (SNA), the premier body for arts in the country is languishing without an editor and with no regular issues coming out. In a country with a population of more than 130 crores, there is no serious academic journal on dance. Much has been spoken about the SNA and the culture departments and the bureaucrats and how they have failed to deliver. But what about the dance community? Impeccably dressed to kill, they light up any party or gathering. Scratch the surface and there is a vicious streak of jealousy and self centred vanity and even intolerance. Standards of dance are not getting any better. The best in most cases is just mediocre. Spouting a few slokas here and there with the torso bent with humility which can vanish to expose claws and fangs at the slightest review of their work by able critics, the dancers (there are exceptions to the scenario) make for a scary world. Kolkata, the eastern metropolis, is lucky to be rich in its number of well-groomed Odissi dancers. Thanks to several visits, residency programmes and extended workshops that legendary guru Kelucharan Mohapatra conducted in this part when he was alive, a number of his illustrious disciples today perform and run disciplined centers of training and performance here. Sharmila Biswas and Sutapa Talukdar have been foremost among them and now the young Subikash Mukherjee has joined the rank. Bahana and Ravash were two of the most recent works of the last two choreographers. Odissi on High, the latest of Ramli Ibrahim's concepts, presented by Malaysia's Sutra Foundation at Kuala Lumpur's Experimental Theatre, Universiti Malaya, had audiences exclaiming over the verve and vivacity and excellence of the presentation. But one was more taken up with the manner in which Odissi as an art form has acquired such a strong permanent presence in a region outside of Odisha or even India. Even more mind boggling was the fact of the same ticketed programme presented over four evenings consecutively, attracting good audiences every evening. Try as one would, the comparison with India just could not be wished away, and I was unable to erase the image of our spoilt public wanting invitations, with even friends and so called well wishers having to be cajoled into attending dance events. How does Ramli Ibrahim, settled in an area which cannot provide him with the allied disciplines needed for Odissi like mardal percussion, Odissi music, Odiya poetry for thematic material, present a block buster festival every year? From where does he get the resources? Theatre - - in all its manifestations - - forms the lifeline and blood sinews of the culturally conscious people of Bangladesh. Jatra and other folk variants are favorites and, come winter, the whole countryside goes agog especially with Jatras, mythological or historical or even socially nuanced ones, often running through entire nights. The rich literary heritage of Bengali lingo does not preclude adaptations from Sophocles and Shakespeare, Ibsen and Brecht. 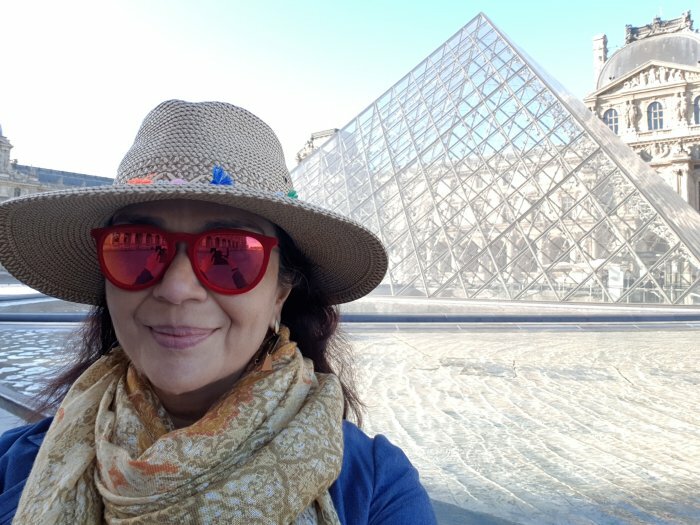 A new surge of life has come into the vibrant performing arts scene after the liberation of the country in 1971, today's playwrights and theatre personalities are justifiably varied, and many theatre groups fly their bastion of excellence with great aplomb. Theatre Narrative from the East, held recently at the E.Z.C.C, Kolkata, from June 22-28, showcased seven plays performed by as many theatre groups from Bangladesh. One major trend that emerged from the festival was the canvas of a woman's life: her love, separation, deprivation, chastity, struggle for survival, self-sacrifice and the history of sheer fight for existence. The patriarchic society seems always to control her destiny and determines her self-expression in conformity with the male-defined norms. This critic took up two folk annals that poignantly echoed this age-old ethos and registered their muted protest. In continuation of the two day festival of Manipuri dances celebrating birth centenary of Guru Bipin Singh, Lubna Marium arranged Rangasree Bharatanatyam Festival (June 24 & 25, 2018) showcasing artists of Shadhona at Nat Mandal Theatre Studies Department of Dhaka University. Two years ago, I had seen Amit Chowdhury and others at Khajuraho Dance Festival. Bangalore based Kirti Ramgopal, disciple of late Padmini Ramachandran, had trained him with few Bharatanatyam numbers including a varnam. In Bangladesh, Bharatanatyam performances by leading dancers from India are arranged by ICCR and Indian High Commission. Leela Samson, C.V. Chandrasekhar, Alarmel Valli have performed at Dhaka often. They have been also invited privately. Under ICCR, C.V. Chandrasekhar has often conducted Bharatanatyam workshops and offered training in Bharatanatyam. Other dance forms like Odissi and Mohiniattam have also been staged in Dhaka by Madhavi Mudgal and Bharati Shivaji. Lubna Marium has received training in Bharatanatyam at Kalakshetra for a brief period. She is anxious that Bharatanatyam dance form takes roots in Bangaldesh. Samson has trained a young Muslim dancer Anisul Islam Hero and he trains young students in Bharatanatyam. At Shadhona under Kolpotoru, several Rongoprobesh (arangetram) have been arranged in the past and regular training twice a week in Bharatanatyam is given. Amit Chowdhury supervises the classes. He is working in Theatre Studies Department and carries on practicing as well as learning whenever he gets opportunity. From Kolkata, Rajdeep Banerjee, a Bharatanatyam teacher, has earlier trained him in Bharatanatyam. Later on he took further lessons from Kirti Ramgopal. Recently, I watched a most interesting performance of Sadir. It was a first for me. The fact that it was Bharatanatyam, but the performance very different from what a regular Bharatanatyam recital looks like, made me want to understand more about the research that goes into the production. 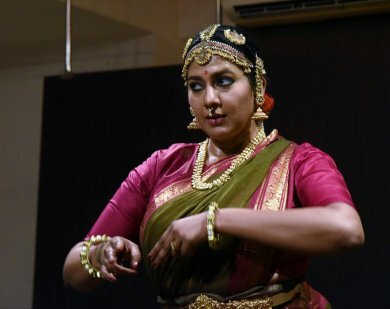 Swarnamalya Ganesh is a dancer, who has been researching not just Bharatanatyam pieces to be performed, but also the dance itself - how it was influenced by cultural and political changes, who practised it, their lives and society, and the more secular repertoire that said a lot about all of this. Here is an interview about a recent performance in Delhi called When Stories Take Form, in which she presented stories about the settings and audience for Bharatanatyam - or Sadir - during the colonial rule in the Madras Presidency. This metropolis saw, in quick succession, two quality productions with mixed media: a multi-starrer spectacular - with nearly a hundred actors - - as an audio-visual extravaganza and the other a lonely monologue of a hapless girl led astray by an unkind world. Interestingly, both productions had credible choreographic inputs by Sudarshan Chakravorty, who steers Sapphire Creations. Bangladesh Shilpakala Academy arranged a two day Manipuri dance festival in collaboration with Guru Bipin Singh Centenary Festival to pay tribute to the legendary Manipuri guru in Bangladesh. It was Guru Bipin Singh’s disciple Shantibala Devi who had thirty years ago during her visit to Dhaka started teaching Manipuri dances to local young girls. Among them was Tamanna Rahman who took to studying it seriously. The seeds of Manipuri dance were thus planted in Bangladesh.